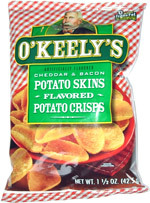 Do you want to compete with potato skin chips in the vending machine wars? Then you better be the most Irish. After a deep assessment of what makes something sound like a pub – and the difference between Irish and British pub naming – the answer to this Frito-Lay challenge was on my iTunes playlist. When Keely Smith sang back to Louis Prima, I knew that name #1034 was going to be a winner.